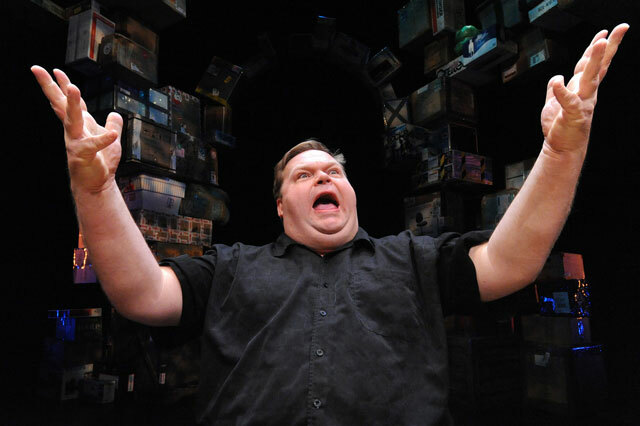 This lengthy report reveals the extent of Mike Daisey’s lies on This American Life and the responses of theaters to the news. On Friday afternoon, Mike Daisey, the monologist who appeared on This American Life earlier in the year to report on apparent abuses of Chinese workers at Foxconn, was revealed to have fabricated and conflated substantial details of his story. Daisey’s lies and errors had proven so severe that This American Life devoted an entirely new episode to clearing up Daisey’s story. Daisey’s tale, which was an excerpt from his one-man show The Agony and the Ecstasy of Steve Jobs, had helped to shape many people’s feelings about Apple. Apple had relied upon its supplier, Foxonn, to manufacture its line of iPhones and iPads. And while an independent investigation from The New York Times earlier this year also revealed unsafe working conditions at Foxconn, there remain significant doubts over whether much of what Daisey has stated on stage and on air is true. Rob Schmitz, a Marketplace correspondent in Shanghai, was able to track down “Cathy” — Daisey’s interpreter for the piece, whose real name is Li Guifen but who also goes by the name Cathy Lee — by putting the terms “Cathy,” “translator,” and “Shenzhen” into Google. He called the first phone number that came up. Cathy Lee did not know that Daisey had used her in his show. She thought that Daisey was merely an American writer. Daisey claimed that the Foxconn guards at the gates had guns. Schmitz said that, in all of his years of reporting, he had never seen guards with guns. “The only people allowed to have guns in China are the military and the police, not factory guards.” This was corroborated by Cathy Lee, who told This American Life that she had never seen a gun in person. Daisey claimed that he met with workers “at coffeehouses and different Starbucks in Guangzhou.” Schmitz pointed out that it was unlikely that factory workers who made fifteen to twenty dollars a day would sip coffee at Starbucks. Because Starbucks is pricier in China than in the United States. Daisey claimed that he talked to hundreds of workers. Cathy Lee said that it was 50 workers on the outside. Daisey claimed that he posed as a businessman to get inside Foxconn’s factories. In fact, Daisey’s appointments were all set up in advance. Daisey claimed that he visited ten factories Cathy Lee told This American Life it was only three. While Apple’s own audits have revealed some underage workers (a total of 91 workers among hundreds of thousands in 2010), Cathy Lee revealed that Daisey had not met any underage workers during his trip. “Maybe we met a girl who looked like she was thirteen years old, like that one. She looks really young,” said Cathy Lee. “I think if she said she was thirteen or twelve, then I would be surprised. I would be very surprised. And I would remember for sure. But there is no such thing.” In the ten years that Cathy Lee has visited factories in Shenzhen, she’s hardly seen any underage workers. Daisey claimed to meet twenty-five to thirty workers from an unauthorized union in an all-day meeting. The meeting did happen. But it was two to three workers, and the meeting was only for a few hours, over lunch at a restaurant. Cathy Lee has doubts about the government-issued blacklist of people who the companies weren’t allowed to hire. While she remembers the blacklist, she says that it didn’t have an official government stamp, which any government-issued document would have. Daisey claimed that he encountered people who had been poisoned by n-hexane, with their hands shaking uncontrollably. But Cathy Lee told Rob Schmitz that she and Daisey hadn’t met anybody poisoned by hexane. The story came from news in 2010, but the hexane poisoning occurred in a Wintek family in Suzhou, nearly a thousand miles away from Shenzhen. Daisey describes an old man who got his hand twisted in a metal press and who has never seen an iPad turned on. In Daisey’s monologue, the old man says, “It’s a kind of magic,” when the iPad’s screen is turned on. Cathy Lee said that this never happened. “It’s just like a movie scenery,” she said on the program. She did say she remembered the guy, but that he never worked at Foxconn. The taxi ride on the exit ramp that ended in thin air 85 feet from the ground? Cathy Lee said that it did not happen. Cathy Lee said that she and Daisey never saw any factory dorm rooms. Daisey claimed that it would not work if he talked with Foxcon workers at the gate. But Cathy Lee has been taking workers to the factory gates for years. In the fact-checking process, Daisey repeatedly lied to Glass and Schmitz. He initially told Glass that he met with 25 to 30 illegal union workers. When pressed by Glass and Schmitz, he knocked the number down to ten. Cathy Lee said it was really between two and five. “Why would Cathy say that you did not meet any underage workers?” asked Schmitz on the program. When pressed further by Schmitz, Daisey claimed to have “a clear recollection of meeting somebody who was thirteen years old” and with another worker who was twelve years old. When confronted about the invented hexane workers on the program, Daisey could not actually confess that he lied. “I wouldn’t express it that way,” said Daisey. “How would you express it?” asked Schmitz. “I would say that I wanted to tell a story that captured the totality of my trip. So when I was building the scene of that meeting, I wanted to have the voice of this thing that had been happening that everyone had been talking about,” replied Daisey. “So you didn’t meet any worker who’d been poisoned by hexane?” asked Glass. When I contacted theater companies on Friday afternoon, it was evident that they were more taken with the “engaging” nature of Daisey’s show rather than its veracity. DJ from New York’s The Public Theater informed me that the three remaining performances of Daisey’s show scheduled on Saturday and Sunday were still on. There were no plans to cancel. But what of theatergoers who might have believed that Daisey’s story is real and who booked tickets in advance of these allegations? “We don’t offer refunds,” said DJ. When I contacted Emily Weiner at the D-Crit Conference, where Daisey is scheduled to speak on May 2nd, I was apparently the first person to inform Ms. Weiner of the news. There was nobody available to issue an official statement. I was also the first to inform a very friendly woman at the Emmett Robinson Theater of Daisey’s fabrications. I left a message with Jesse Bagley, the chief contact person at the Spoleto Festival in Charleston, where Daisey is scheduled to perform from May 31st to June 6th. In the theater, our job is to create fictions that reveal truth — that’s what a storyteller does, that’s what a dramatist does. The Agony and the Ecstasy of Steve Jobs reveals, as Mike’s other monologues have, human truths in story form. In this work, Mike uses a story to frame and lead debate about an important issue in a deeply compelling way. He has illuminated how our actions affect people half-a-world away and, in doing so, has spurred action to address a troubling situation. This is a powerful work of art and exactly the kind of storytelling that The Public Theater has supported, and will continue to support in the future. Mike is an artist, not a journalist. Nevertheless, we wish he had been more precise with us and our audiences about what was and wasn’t his personal experience in the piece. 3/19/12 12:00 PM UPDATE: This morning, I spoke by telephone with John Killacky, executive director of the Flynn Center, who was very gracious with his time. He informed me, as previously reported, that the Flynn Center is going ahead with the March 31st performance of The Agony and the Ecstasy of Steve Jobs. Killacky was sufficiently satisfied with the added prologue and the minor changes in the script, and had been in touch with Daisey’s agent and publicist over the weekend. Killacky felt that the show would still remain compelling for audiences, telling me that one of theater’s essential roles is “to promote dialogue.” To this end, Killacky tells me that he may work in a post-show dialogue with Daisey on stage. He also said that, unlike the other theaters I talked with, he planned to issue refunds for anybody who felt taken in by Daisey’s material. I asked Killacky if he had reviewed the informational sheet that Daisey is handing out to the audience after the show. He said that he hadn’t. I then asked if he had considered offering a secondary sheet of This American Life‘s findings, so that the audience would have enough information to make up their minds. There were no plans as of Monday morning. Throughout our interview, he’d been so convincing; his lies were so detailed and full of compassion and humor. And now I wondered why I was wasting my time trying to poke holes in his facts when I should be writing about the awful things he saw. We talked for a bit more and he invited me to his show. I went, and dropped the story.